Makeup is women most powerful weapon. Every morning is a rush hour for me, I need to apply a quick makeup before I leave my house. Todays, K Beauty products are spreading around the world with their best advance makeup technology to all the ladies. Have you heard of 'Dear, Klairs'? This is my first time heard about this brand and also my first try. Who is Klairs? Klairs is a high-quality skincare brand that provides gentle, simple products for those with sensitive skin. Lets get started with Happy Klairs' day! 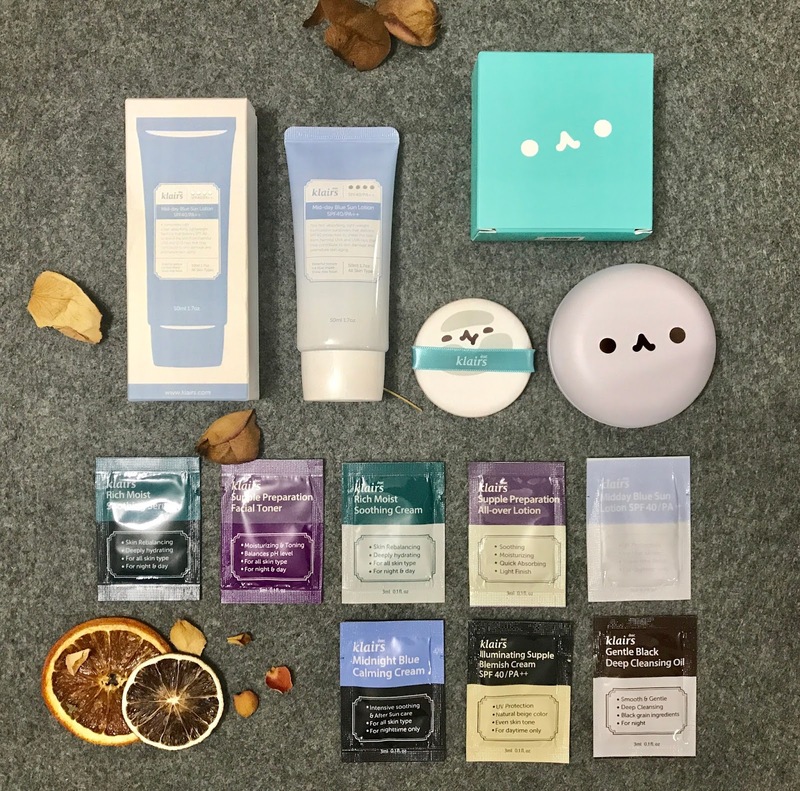 I proudly present these two products from Dear, Klairs - Mochi BB Cushion and Mid-day Blue Sun Lotion. I quite like their packaging as I love their pastel color which is the Tiffany blue and Sky blue color. Thus, I cant wait to try it on. The Klairs all-time best-selling Mochi BB has been improved with a light finish and long-lasting coverage that fights sweat and oil all day, so you don’t have to worry. 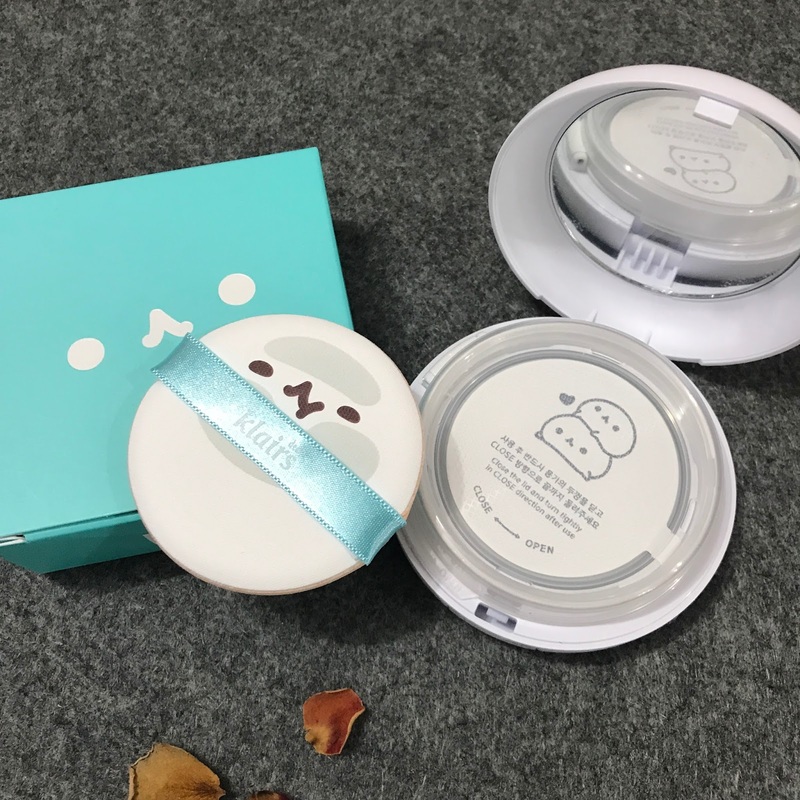 Filling in areas where the Mochi BB was lacking and making the good even better, try the Mochi BB Cushion today. The Mochi BB Cushion is designed as a balm-type product rather than a liquid to better fill in pores for a silky smooth finish. Say goodbye to dull skin with the Mochi BB Cushion, and enjoy clean, refreshing makeup all-year-round! This Mochi BB Cushion also featured the signature apricot-beige tone of the Mochi BB. It complements both warm and cool undertones in a natural way by neutralizing redness of the skin for a healthy look, while color-correcting and brightening dull, uneven skin tones. Coverage is good. It does covered up my redness on the first layer. With the second layers, the redness around my cheeks were almost covered as better than i expect. This BB cushion has no problems staying put for me in last 6-8 hours, even without setting it with any lose powders. Looking good on my face in style and it has slight light floral soapy fragrance. The scent isn't strong and it will fade after application. Next, do I need to use SUNSCREEN daily? YES! A million times yes! Introducing sunscreen that will revolutionize the way you think a bout sunscreens – the Klairs Mid-day Blue Sun Lotion. 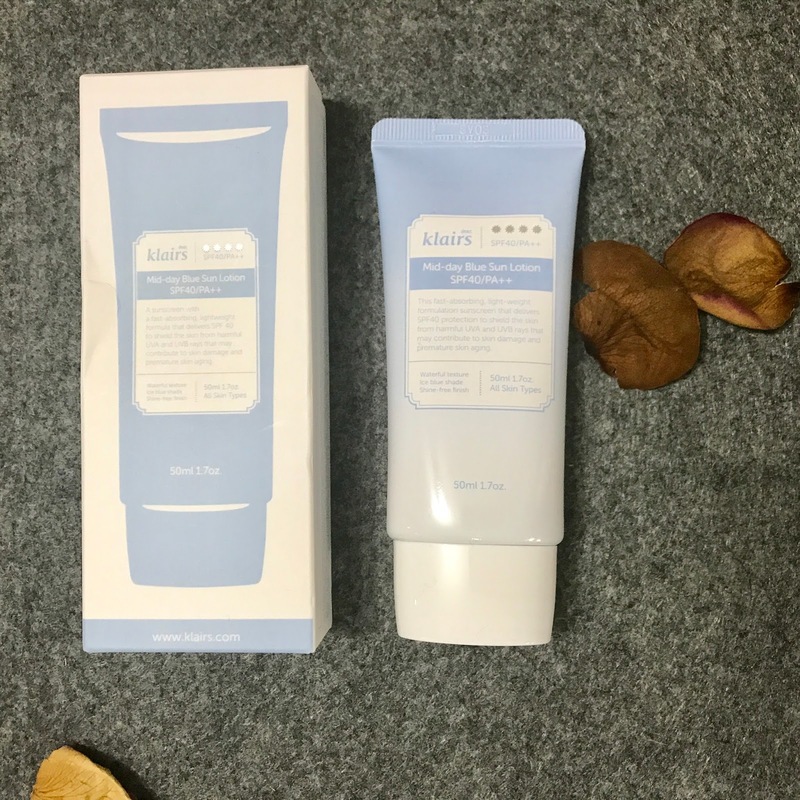 This unique blue sun lotion is made to protect your skin from harsh UV rays as well as providing protection from direct heat to guard your sensitive skin from those miserable heat waves. The Mid-day Blue Sun lotion is a refreshing cream filled with hydration, and has a light, weightless finish without the oily feeling. When applied, it has a subtle glow that transforms into a feathery finish you won’t want to miss out on. The sunscreen has a very pleasant cooling sensation and wet feeling upon application. After applied on the face, the Klairs Mid-Day Blue Sun Lotion glides on very smoothly and easily. And it even create a brightening effect on the skin. It didn’t cause me any skin irritation after wearing it for 8+ hours under with my Mochi BB Cushion makeup. It also doesn't worsen my acne, I am amaze! 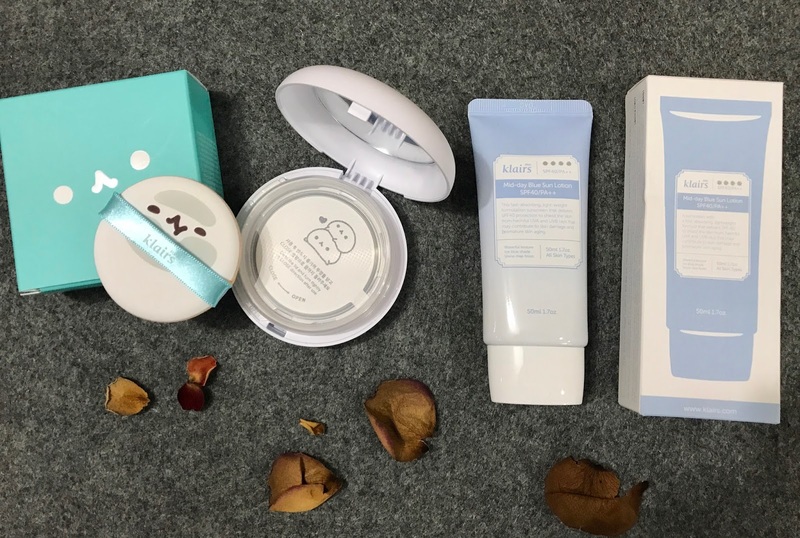 Overall I am absolutely in love with the Klairs Mid-Day Blue Sun Lotion and Mochi BB Cushion. 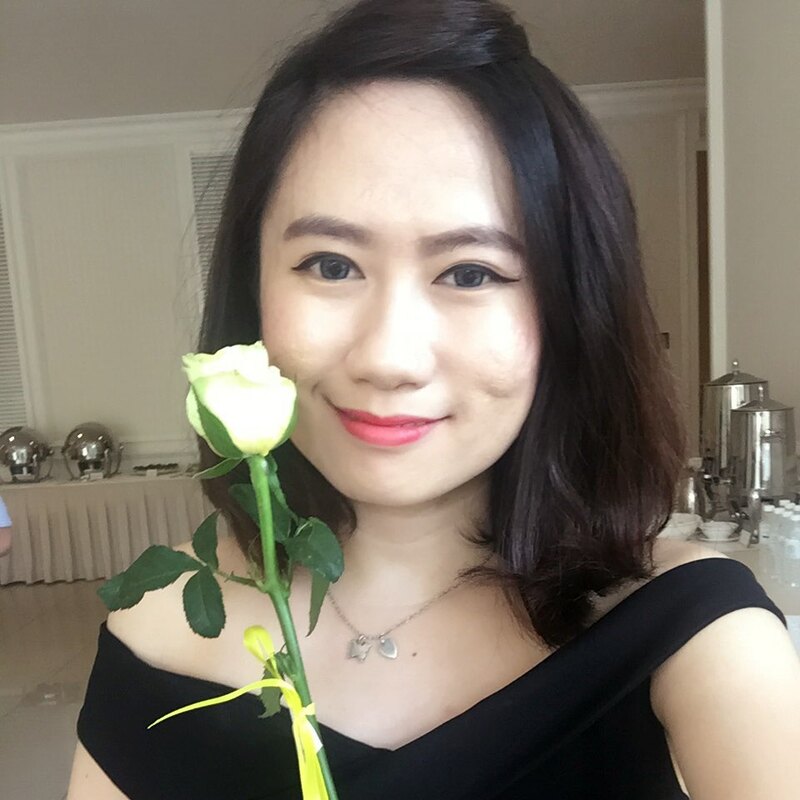 It is the best combination products and now I am using it daily as is my best companion K Beauty products - sunscreen and BB Cushion whenever I go out! Go to Hermo website and get yours by clicking to purchase here!